Austria's ski holiday recipe involves cute little valley villages clustered around onion domed churches, prettily clad wooded mountains and friendly , welcoming people who speak good English and genuinely want their visitors to enjoy their holiday time. It is also the land of Après Ski, in many resorts starting mid-afternoon with dancing in the mountain restaurants and going on long into the evening. Back in the 80's, Austrian ski resorts dominated the British skiing market. However over the past two decades the powerful pull of high, French mega resorts has dragged many skiers away from this region of the Alps. This trend is now beginning to reverse with many British skiers moving back to the traditional villages of Austria. There are three key factors in Austria's revival with the UK market. The most efficient lift systems in Europe are not in France but now in Austria. 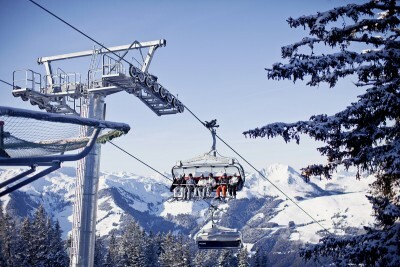 The improvement in the lift system in Austria over the past decade has been massive with the added luxuries of heated seats and covered chairlifts the norm in Austria. The resorts of Saalbach-Hintergleem and Ischgl have the highest proportion of fast lifts in their network out of all the European ski resorts with Kitzbuhel, Lech and St Anton not far behind in the listing. Snow making - Austrian resorts have invested extensively in snow making in all of their resorts to the extent that you can expect reliable snow cover even at the low altitudes typical of Austrian villages. Good value for money - Austrian resorts are generally cheaper than their expensive French counterparts, especially for eating and drinking. A common factor throughout all Austrian resorts is reliably good quality accommodation. All our hotels have been carefully chosen to provide comfortable good value accommodation. All of our hotels are 3, 4 and 5 star standard with excellent facilities - spa's swimming pools etc. Most of all they offer our guests a warm friendly welcome.